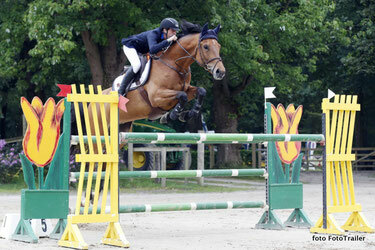 The Belgian Junior riders were extremely successful in the Small Tour at 1.30m level this morning. Winner of the Stal Peter Geerink Prize was Axel Vandoorne with Divine Louise (Clinton). The Belgians Dieter Vermeiren and Mathias Hazebroek finished 2nd and 3rd. 5. Johanna Biber, AUT, Sonnenbluemchen B (Cola).